Premature Evaluation is the weekly column in which we explore the wilds of early access. This week, Fraser has been cast adrift in space in roguelike spaceship sim, Shortest Trip to Earth. Expect alien rats, explosions and… respecting the environment. Rats cut my first stellar trip short. On nautical voyages, they used to spread disease and eat supplies that were needed for the long, long journey. Up here, in space, they are a pain in the arse for very different, but even more troublesome, reasons. The rats have forged an empire, you see; an empire built on strict hierarchies, xenophobia and robbing travellers. They also blew up my beautiful ship. 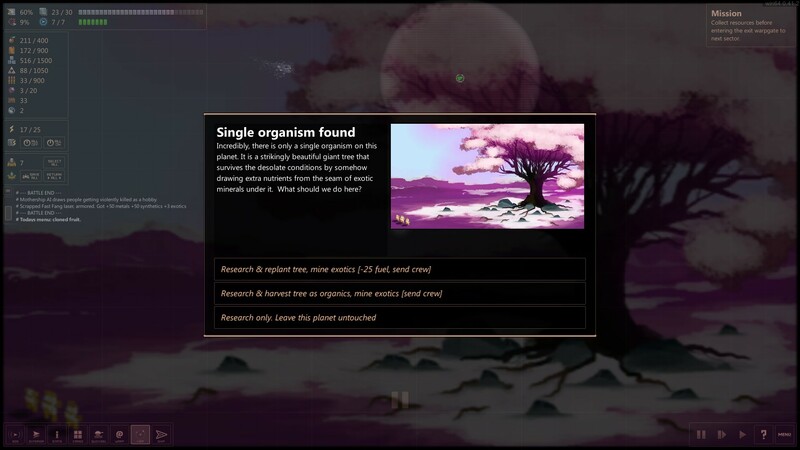 Like FTL and Out There, Shortest Trip to Earth is a cosmic roguelike that tasks captains with flying through hostile space, system by system, until the crew reaches safety, in this case, Earth. In between, chaos reigns, with random ship encounters, malfunctions and worlds throwing their entire nuclear arsenal at you. When you send some crew down to a planet on an expedition, you never know what they’re going to uncover; maybe it’s just resources, but it might also be a colony of worm monsters with ravenous appetites. My crew was made up of six humans, one cat and one drone. The ship (one of two available at the start, with more that can be unlocked), which looks an awful lot like FTL’s Kestrel, starts out with the basics: a mix of missile launchers and laser turrets, an engine, a warp drive, multiple reactors, shields, sensors and plenty of storage. The basics, it turns out, include quite a lot. At the start of the journey, I upgraded a few components and picked up some extra resources, spending perk points and some cash. It was mostly at random, not knowing what to expect out there. It’s a lot to take in, at first glance. And the next 100 glances. The quick but helpful tutorial is welcome, but The Shortest Trip to Earth is densely packed and not the sort of thing you can get a feel for on a test run or by reading the fairly comprehensive encyclopedia. Some experience with other space-faring roguelikes will certainly make these early moments go down much smoother, but on top of the familiar are lots of other layers that will inevitably throw you a curveball. But that’s OK! There’s nothing like an unexpected disaster to get the blood pumping. The first system the ship jumped to was, I was surprised to find, extremely chill. We mined a gas giant and nabbed some extra fuel, we extracted resources from a forest world while taking care not to destabilise the ecosystem and we found an insectoid trader who gave us a great deal on some food, along with a barrel of blood. Who doesn’t want a barrel of blood? Aside from a minor collision with an asteroid, it was an extremely gentle introduction to space exploration. 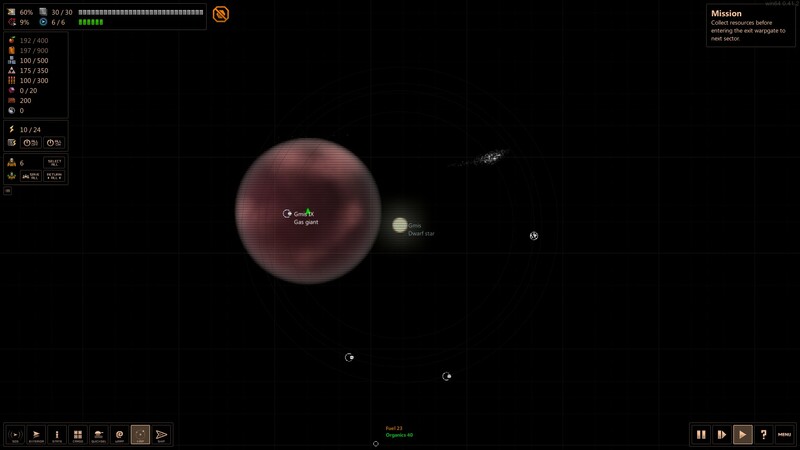 Planets and anomalies scanned and visited, we took off for the next system. 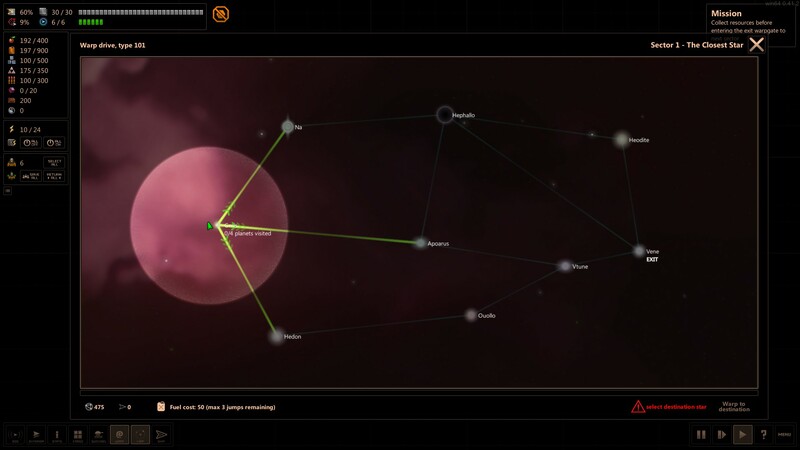 Each sector contains several stars, connected via warp paths. The goal is to get to the final star system and then travel through an ancient gateway to the next sector, but the path isn’t linear. You might want to visit every star, and all the planets spinning around them, trading, fighting, mining and generally trying to bleed each system dry before moving on. That increases your chances of getting rich in both resources and fancy ship components, but it also makes it a lot more likely that you’ll run out of food or fuel, or just get blown up by some pirates. You can dawdle in a system or sector for as long as you want. Instead of being pushed, you’re being pulled, ever so slightly, to the gateway, but on your own timeframe. There’s so much more room for exploration, then, when compared to FTL, and each procedurally generated galaxy is bursting with stories. You never quite know where they’re going to lead. In the second system, we encountered an industrial civilisation that warned us to leave them alone. We did not. I commanded the crew to fire off some drones to spy on our new friends, not expecting the pre-spaceflight thickos to notice. They absolutely did notice, however, and they reacted poorly. They launched all of their nukes at us, one tiny spaceship, but being a lot slower than a ship that can travel at faster-than-light speeds, they shouldn’t have been a threat. Unfortunately, I was still feeling cocky, so I decided it would be a great idea to try and catch some nukes. Why not, right? It worked! Kinda. The ones we didn’t catch managed to hit us, doing quite a bit of damage to both ship and crew. Even when the options are binary – and they frequently aren’t – like choosing to rip resources out of a world without protecting the indigenous flora and fauna or cautiously taking only what you need, they can have lingering effects or kick-start another round of important decision making. You might just see a few boxes of brief but well-written, playful text, but there are all these paths not taken, hidden from view. I’ve come across similar planets to the one above since that unfortunate meeting, but the result has been different each time, not just because I picked different options, but because the RNG also worked its fickle magic to conjure up a new anecdote. I promised rats but have yet to deliver, so let’s talk rodents. My first encounter with the Rat Empire was a shakedown. I was flying through their territory, apparently, and had to pay the toll. They accepted xenodata, the galaxy’s main currency, and exotics, a rarer currency that that’s especially handy if you anticipate bribing a lot of folk. I went for option 3: blow them up. Battles can involve more than two ships, but this time I just had to worry about one piddly little vessel, less than half the size of my own. They play out in real-time but with several speed settings and, thank god, a pause button. The bridge can control everything, but putting crew on shields and weapons makes them more effective, so everyone on my ship was working hard as the rat lasers prodded and probed. My own lasers were weakening their shields, but I wanted to flex my muscles a bit. 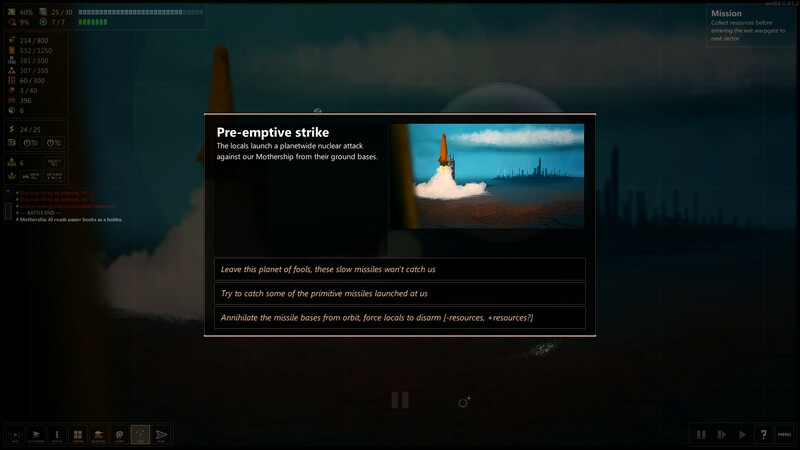 Missiles can bypass shields, as long as they don’t get shot down before hitting their target. Unfortunately for the rats, my missile made it through, setting fire to the bridge and killing their dastardly captain. 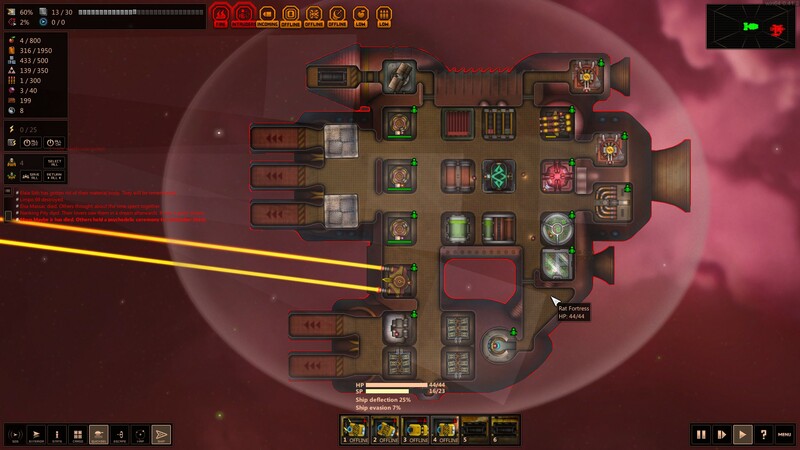 Broadly, combat is a lot like FTL’s. You need to worry about powering the weapons, they’ve all got cooldowns, so the goal is to disable critical components like shields and engines, and despite the fights being real-time, there are definitely some turn-based sensibilities. Dig down another layer, however, and the differences become more apparent. 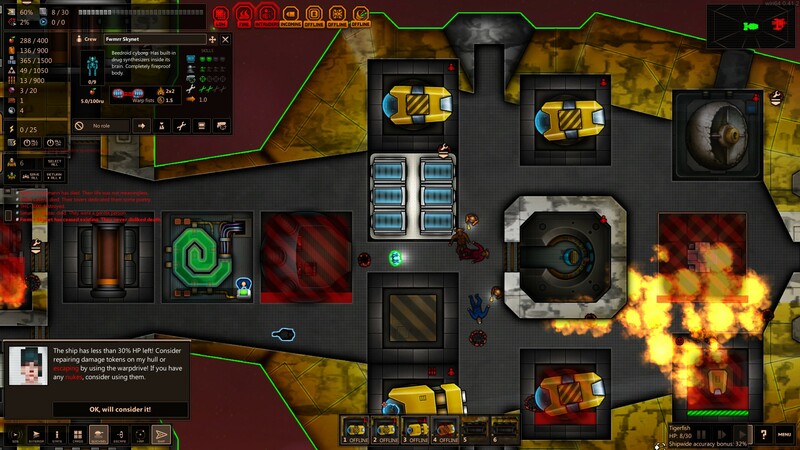 Despite the moniker of spaceship simulator, Subset Games’ brilliant roguelike often took an RPG approach to progression, but instead of experience, there was scrap that could be spent on upgrading systems like the shields or the reactor. In Shortest Trip to Earth, if you need more power, you buy a better reactor. Or just plonk another reactor into a spare slot. 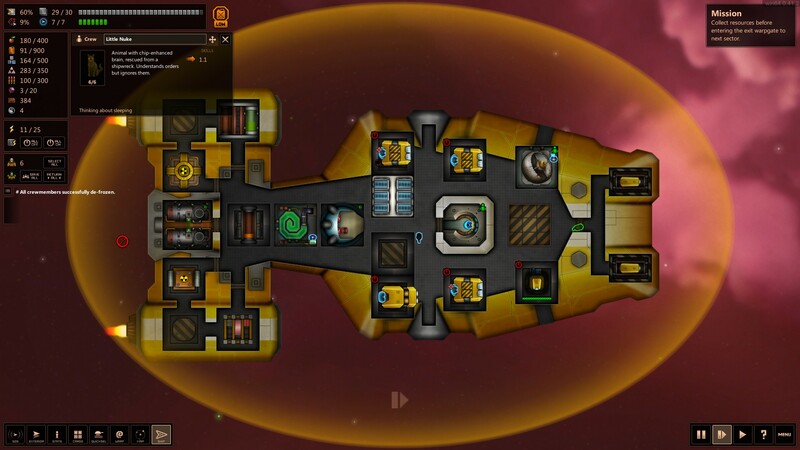 Ships are more modular, and there’s a lot more space to enhance them. It still won’t be enough space, of course; more than once I found myself having to choose between two equally worthy weapons. The victory made me bolder, flying through asteroid belts, risking an empty to tank to hunt for space mysteries, sending my crew out on potentially perilous missions. So when we finally floated up to the gateway to the next sector, I didn’t even consider paying off the rodent guards barring my ship’s way. It was a mistake. I regretted my boldness immediately. 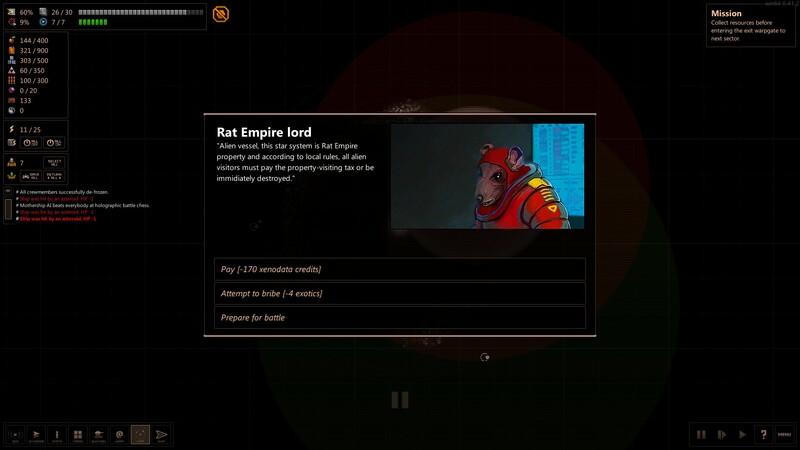 This Rat Empire ship was a beast, bristling with missile launchers, lasers and point defence turrets. My lasers impotently needled their shield, while my few remaining missiles were neutralised before they even got close. I started to panic, and that’s when the boarding party appeared. Lasergun-toting rats skittered through my ship’s corridors, but putting up a fight also meant taking my crew off the guns. They can be controlled remotely from the bridge, which would have been great if the one member of the crew on the bridge wasn’t dead. It was right then that I remembered I could customise my crew’s loadouts, making them more effective in combat. Oh well! You live and learn. Well, you learn. The ship was burning, its mangled insides were exposed to space and the last member of the crew was putting up a valiant last stand, along with the ship’s mascot, our kitty. Does the RSPCA have anything to say about bringing cats on long space voyages through hostile alien territory? It would have to remain a mystery. Seconds later an explosion ripped the ship apart, the detritus briefly swallowed up by a blinding flash. It was over. My first journey may have ended abruptly and with fire and death, but Shortest Trip to Earth is a rare roguelike that doesn’t feel endlessly adversarial. There are lots of ways to avoid conflict, and I’ve spent considerably more time having a nosey around alien planets than getting into fights, even when I was trying to blow up every rat I came across. The roguelike elements are not ancillary, though. The threat of being stuck in space with a starving crew and empty fuel tanks looms over every trip, and the inevitability of death is obviously a boon for a game that has so many different stories to tell. I’ve yet to get through all five sectors – I’m a terrible captain – but I’m more than content to muddle through at my own rambling pace. There are lots of planets to explore, aliens who aren’t rats to meet, and do I really want to go back to Earth? It’s awful! There are another five sectors in development, anyway, so Earth will have to wait, regardless. It’s certainly not half a game, however, and the most notable indicator that it’s in early access isn’t some huge gap in its systems, it’s the rubbish UI, or more specifically, the rubbish system map. The interface is unobtrusive, most of the time. It’s all hidden away and squashed at the peripheries of the screen, all tiny numbers and icons. And it’s not like the game uses all of this extra real estate. The ship screen is busy, sure, but when you’re flying through space, it’s mostly just an empty void, peppered with the occasional and also very tiny planet or ship. It’s amazing that anything interesting happens in these empty stellar maps. Interesting things happen all the time, though. Something’s been eating at me on my current journey. We stopped at a planet full of contemplative scholars who were willing to be interrupted from their contemplations for only one visit, during which they offered us one of two gifts: materials or knowledge. No strings. We were running low on supplies, our bellies were empty and there were more holes in the ship than seemed safe; I had to pick the former. And they weren’t lying. They gave us lots of resources and probably saved the whole ship. But when I answered, they were smug, and they boasted that they knew what I was going to pick. That ruffled my feathers, but I’m also wondering about the door I didn’t open. I’m actually looking forward to starting again.